Boys to Men Mentoring is a 501(c)(3) nonprofit organization that is committed to creating communities of dedicated men who encourage and empower disconnected and fatherless boys on their journey to manhood. We have a proven approach that produces real change within young men, and we couldn’t be more excited to lead the charge in a much overdue movement. The circumstances and daily environment that many of our nation’s youth experience is absolutely heart-breaking. Despite this reality, we can’t help but remain passionate and optimistic for we have found a answer that we works for these young men. Every week, our mentors show up at middle schools, high schools, and community centers to give teenage boys a community of men who listen, encourage, and empower them. Additionally, approximately 40% of the boys participating in our programs are growing up without a father. Our community based mentoring approach gives boys a variety of positive male role models who show up consistently, tell the truth about their struggles as men, ask the boys what kind of man they want to be, praise them for their gifts, support them when they mess up, and encourage them to become the man they want to be. We are dedicated to providing this opportunity to every boy in need. 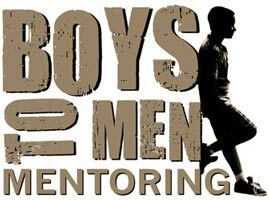 The Boys to Men Mentoring Network was founded in 1996 by Herb Sigurdson (1927-1997), Joe Sigurdson and Craig McClain. Herb was a former Executive Director of Father Flanagan’s Boys Town and dedicated his life to building a better world. Herb, Joe and Craig assembled a team of committed men to create a mentoring program for teenage boys. They designed a mentoring program that includes elements of community involvement, a boys adventure weekend retreat, and effective mentoring practices. Our Boys to Men curriculum is being replicated on a community level to help young men throughout the world. Since 1996, the program has spread across the United States, and now has international centers in Canada, Europe and South Africa. More than 7,000 boys and men have participated in our program as of March 2012 within San Diego County.